In 1920, a mysterious epidemic broke out in the cattle populations of the United States and Canada. It was a severe disease of internal hemorrhaging that struck quickly and inexplicably; ranchers were soon distraught at the losses to their herds. Two years later, Frank Schofield connected the disease to sweet clover hay, which had been widely used as cattle fodder since the beginning of the century. But the agent behind hemorrhagic sweet clover disease remained elusive. The turning point came in 1933, when a farmer drove to the University of Wisconsin with a truckload of spoiled hay and blood from a cow that had died after eating some of it. The farmer’s plight caught the interest of Karl Link, an associate professor of agricultural chemistry. Seven years later, Link and his colleagues announced the purification and synthesis of dicumarol, the hemorrhagic agent in spoiled sweet clover hay. It seems that a series of wet summers had led to the infection of sweet clover fields by mold. 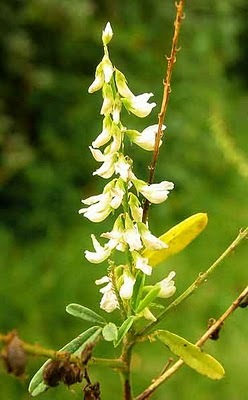 In response, the sweet clover plants produced coumarin, a natural compound that defends against fungal infection. With the support of the Wisconsin Alumi Research Foundation (WARF), Link and his colleagues synthesized over 100 analogues based on dicumarol’s structure. In 1946 they developed the highly potent form that was patented by the WARF organization. It was a compound that smelled, appropriately, like freshly mown hay. It was a toxin deadly enough to be used as a rat poison. They named it warfarin. Blood Thinner or Rat Poison? At first, warfarin was considered too toxic for human use. It was marketed as a rodenticide, and became a popular rat poison. In the 1951, a navy recruit took a large dose of warfarin to attempt suicide. Surprisingly, he lived, and clinical trials soon thereafter showed that warfarin could be administered safely to humans. The idea of warfarin therapy became widely known in 1955, when it was given to President Eisenhower after a heart attack. Today, warfarin is most frequently prescribed oral blood thinner, and the eleventh most-prescribed drug overall. It’s given to patients where unwanted clotting is a risk — after surgery, stroke, pulmonary embolism, or deep-vein thrombosis (DVT). Unfortunately, warfarin has a narrow therapeutic range. Too little, and it has no effect on clotting. Too much, and the patient could suffer internal hemorrhaging. To further complicate things, the correct warfarin dose is influenced by a number of factors – clinical ones (weight, age, INR), diet, heritage, etc. It became apparent that genetic factors play a critical role in effective dose of warfarin. Two genes in particular have been demonstrated to modulate warfarin response: VKORC1, which encodes a component of the vitamin K epoxide reductase (VKOR) complex that is targeted by warfarin; and CYP2C9, the cytochrome P450 enzyme primarily responsible for metabolizing the drug. Numerous other genes have been implicated as well, though none have proven more informative than VKORC1 and CYP2C9 genotypes. The clear genetic component, and the as-yet-unraveled complexities of correct dosing, are probably why warfarin has become the poster-child for pharmacogenetics. Last month, a team led by Brian Gage at Washington University in St. Louis published an elegant formula for warfarin dosing that takes clinical and genetic factors into consideration, in conjunction with a web site (www.WarfarinDosing.org) where clinicians can use it to calculate and track patient doses. This month, the National Heart, Lung, and Blood Institute (NHLBI) announced a five-year, $3.7 million clinical trial to assess warfarin risks and benefits. The Genetics InFormatics Trial of Warfarin (GIFT) trial, to be led by Brian Gage and his colleagues, will enroll knee- and hip-replacement patients at our own Barnes-Jewish Hospital to improve upon the warfarin dosing formula. It’s the most interesting story I’ve heard that begins with a farmer, a cow, and the state of Wisconsin. Strange how the mysterious sweet clover disease, described as “an insidious hemorrhagic disease” by the Merck Veterinary Manual, would yield a compound so valuable for human health. Next-up how heart disease research led scientists to unexpectedly discover boners for the free world. All kidding aside, this was a fascinating read and I always like to have a little knowledge dropped on me. Thanks.